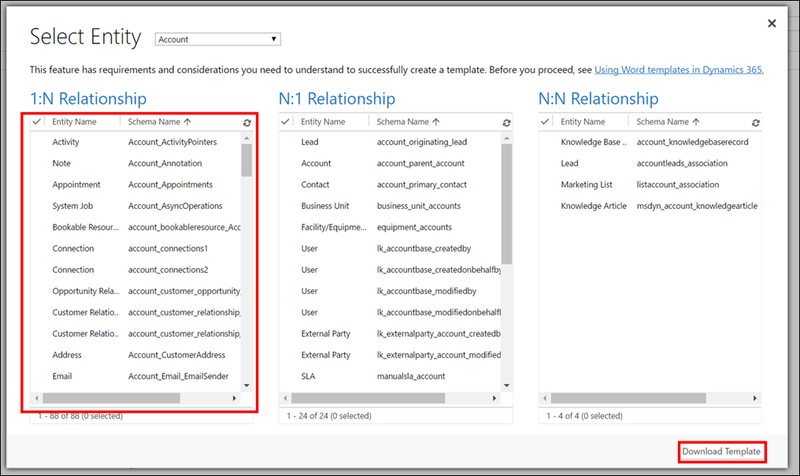 How to Create a Microsoft Word Template in Microsoft Dynamics 365 - Dynamic Enterprise Technologies, Inc. 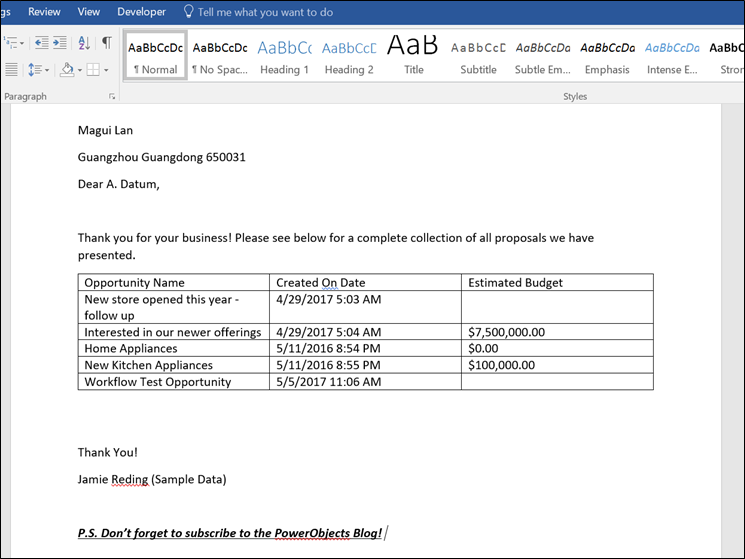 In a previous blog you’ve learned How to Easily Generate Excel Templates, but what if you wanted to use Microsoft Word? 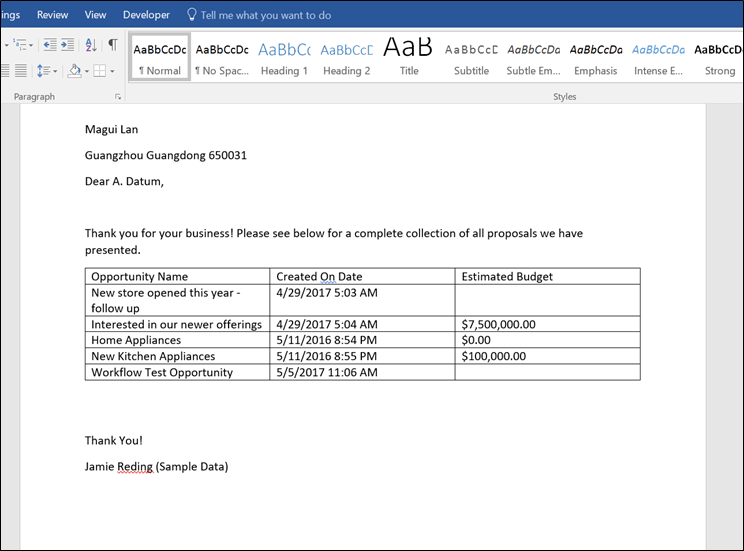 Using Microsoft Word templates in Microsoft Dynamics 365 can be a huge time-saver when you want to provide a professional document for an entity, especially if you need to make the document more than once for more than one records. Let’s get to it! What are Microsoft Word templates? 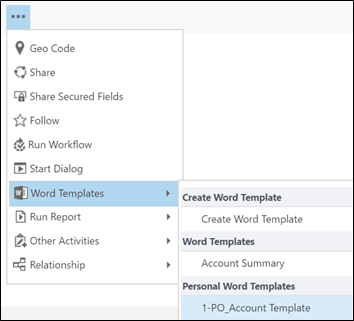 Microsoft Word templates are documents that are created once, but can be used on multiple records directly from Microsoft Dynamics 365. 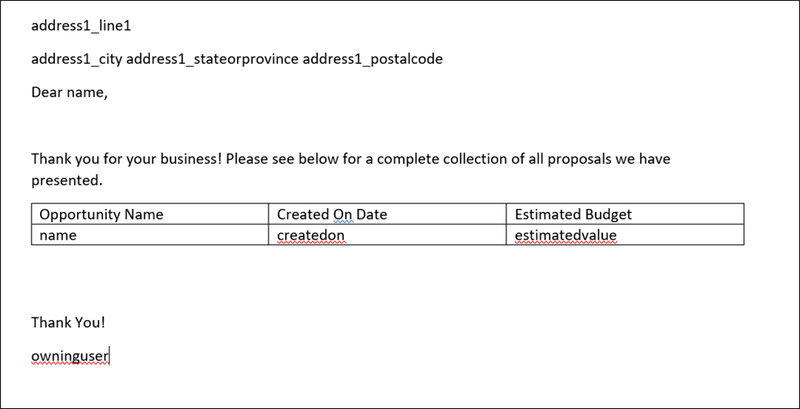 Templates can be used to generate anything from thank you notes, to birthday cards, or even a list of opportunities associated with an account by using XML – but before you run to get a developer, don’t worry, no coding is required! When would you use a Microsoft Word template? If you wanted to send a note to a key contact on their birthday you could create a “Happy Birthday” template, once you print it off you could give it your own signature to add a personal touch. Another case would be if you wanted to remind an account of all their opportunities and the associated proposed budgets. A third example is if you wanted an account to verify the contacts on their team and what levels of authority each has such as purchasing authority, service-ticket creation authority, or IT architecture authority. Or, anytime that you want information from an Account, Contact, Opportunity or any entity to auto-populate into a Microsoft Word document for mailing, emailing or reporting. How to Create a Microsoft Word Template? 5. Select any related entities that you will use in the template such as Opportunities, Quotes, Orders or Invoices. Once you click “Download Template” the download will start automatically, and the resulting file will look like a blank MS Word document. 6. In Microsoft Word, make sure the developer tab is shown in the Ribbon. If it is not, right click the Ribbon and select “Customize the Ribbon” in the right pane, check the box next to Developer and select ok. Once the developer tab is on the ribbon click “Display the XML Mapping Pane” under the developer tab. 8. As you type your document, right-click fields to insert them into the document. 9. You can insert tables as well creating the table in Microsoft Word, select the row, then right click on the opportunity entity at the bottom of the XML Mapping Pane, expand the Insert Content Control section and select repeating. 10. Then populate the table with content control just like before. 11. The next step is to upload the Word Template so that it can be used. 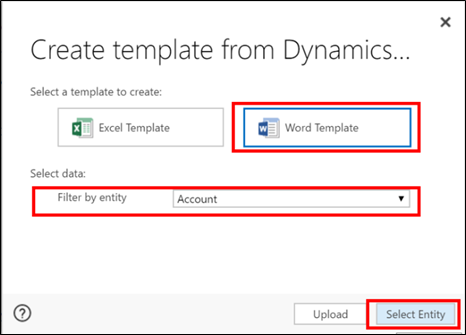 Save your word document and navigate back to Dynamics 365 and repeat steps 1-4, but instead of clicking select entity, click on the upload button. Then browse to your file and upload the document. 12. Once Upload is complete, the template is now available for use on the account page. Test your work by navigating to an account, selecting the ellipsis> Word Templates > Personal Word Templates, and select your desired template. 13. 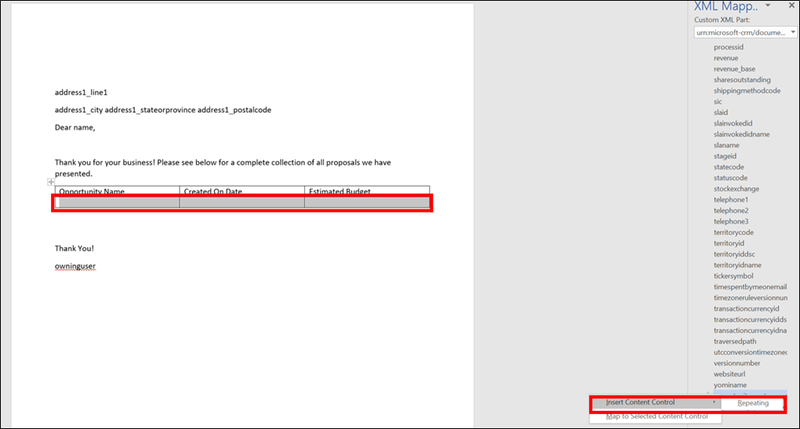 If you want to make any changes to the document once you download it you can, just like you word in a regular document. So, if you’re sending out birthday cards, providing updates or confirming information. If you need to make the same form more than once, create a template and eliminate the busy work of recreating documents. Be sure to subscribe to our blog so you have immediate updates to all of the new tips and tricks for Microsoft Dynamics 365, and if you would like more in-depth information on any CRM topic check out our CRM Book! ©2019 Dynamic Enterprise Technologies, Inc. All Rights Reserved.